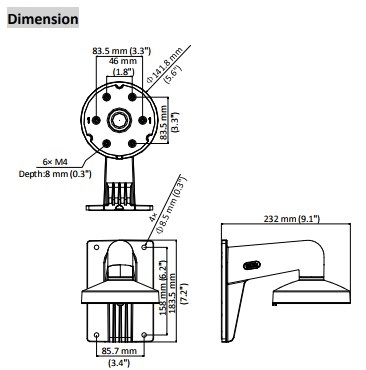 The DS-1273ZJ-DM32 Wall Mounting Bracket for Hikvision Dome Cameras. Aluminum alloy material with surface spray treatment. The lower bowl facilitates the installation. Water proof design. The bracket should be installed on the flat wall. The wall must be capable of supporting at least 3 times as much as the total weight of the camera and the bracket. The maximum load capacity of the bracket is 3 KG (6.6 lb. ).